The protective relay is the device that responds to signals from the transducers by quickly initiating or allowing a control action to be implemented in order to prevent damage to the faulted equipment and to restore service as soon as possible. The operating characteristics of the more commonly used protective relays are described in this section. A relay is said to pick up when it operates to open its normally closed (NC) contact or to close its normally open (NO) contact in response to a disturbance to produce a desired control action. The smallest value of the actuating quantity for the relay to operate is called its pickup value. A relay is said to reset when it operates to close an open contact that is normally closed (NC) or to open a closed contact that is normally open (NO). The largest value of the actuating quantity for this to happen is called the reset value. The actuating quantity of an overcurrent relay is a current. The relay is designed to operate when the actuating quantity equals, or exceeds, its pickup value. An overcurrent relay can be either of two types: instantaneous or time-delay type. Both relay types are frequently provided in one relay case and are actuated by the same current; however, their individual pickup values can be adjusted separately. The pickup values may be adjusted by varying the tap settings in the input. The instantaneous relay element has no intentional time delay, and it operates quickly from 1/2 to 3 cycles depending on the value of the fault current. A typical operating characteristic of this relay type is shown in Fig. 1. The time-delay relay element is characterized by having an operating time that varies inversely as the fault current flowing through the relay. A typical inverse time characteristic is shown in Fig. 1. The time-delay characteristic may be shifted up or down by adjusting the time-dial setting so that the relay operates with a different time delay for the same value of fault current. The difficulty in using overcurrent relays is that they are inherently non-selective. They detect over-currents (faults) not only in their own zones of protection but also in adjacent zones. The selectivity can be improved by proper coordination of the relay pickup values and time-delay settings. As the electric load grows and the power system configuration changes, operating conditions and magnitudes of short-circuit currents will vary. 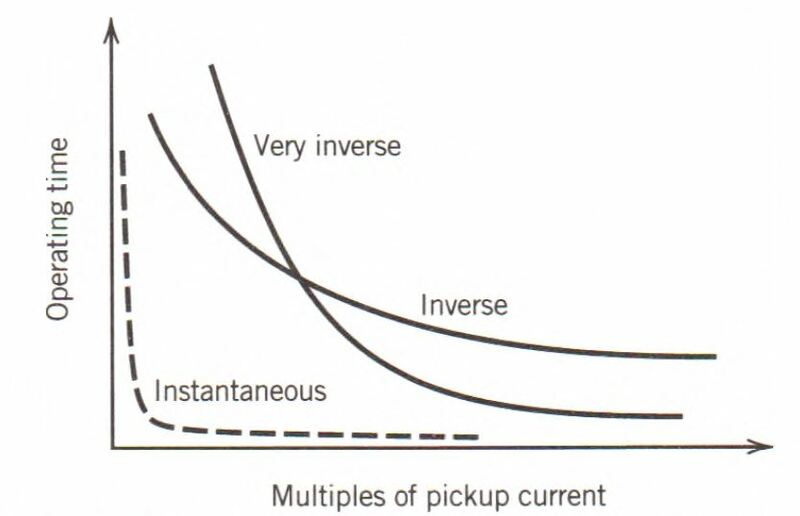 The pickup values of the overcurrent relays have to be readjusted continually in response to these changes. Overcurrent relays are popular especially on low-voltage circuits because of their low cost. They are also used in specific applications on high-voltage systems. Figure 1: Time characteristics of overcurrent relays. A directional relay is able to distinguish between the current flowing in one direction and the current flowing in the opposite direction. The relay responds to the phase angle difference between the actuating current and a reference current (or voltage) called the polarizing quantity. Directional relaying is typically used in conjunction with some other relay, usually the overcurrent relay to improve its selectivity. The operation of a differential relay is based on the vector difference of two or more similar electrical actuating quantities. The most common application is current differential relaying, in which the current entering and the current leaving the protected element are compared. If the difference exceeds the pickup value of the relay, it operates to trip the breakers to isolate the element. Typical differential relaying employing an overcurrent relay is shown in Fig. 2. Identical current transformers are placed at both ends of the protected element, and the CT secondaries are connected in parallel with an overcurrent relay. The directions of current flows shown in Fig. 2 are those corresponding to normal load conditions or to a fault external to the protected element. Thus, it is seen that the CT secondary currents merely circulate between the CTs, and no current flows in the overcurrent relay. Suppose a fault occurs on the protected element as shown in Fig. 3. The short-circuit currents flow into the fault, and the CT secondary currents no longer circulate. The vectorial sum of the CT secondary currents flows through the overcurrent relay and causes the relay to disconnect the element from the system. Figure 3: Fault currents in a differential relay. Even though the current transformers used for the differential relay are identical, the secondary currents may not be identical because of CT transformation inaccuracies. Thus, the secondary currents will no longer merely circulate for normal load conditions or for external faults. The differential current that will flow through the overcurrent relay may be sufficient for the relay to pick up and cause false tripping of the circuit breakers. The difficulty encountered in differential relaying due to CT errors is eased by the use of a percentage-differential relay. This type of relay has an operating coil and two restraining coils. The operating current is proportional to (IA – IB) and must exceed a certain percentage of the restraining current, which is proportional to 1/2(IA + IB) before the relay will operate. In a distance relay, a voltage and a current are balanced against each other and the relay responds to the ratio of the voltage to the current, which is the impedance of the transmission line from the relay location to the point of interest. The impedance may be used to measure distance along a transmission line, hence the name distance relay. This distance relay is useful because it is able to differentiate between a fault and normal operating conditions and to differentiate between faults in a specific area and a fault in a different part of the system. The operation of the distance relay is limited to a certain range of pickup values of impedance. The distance relay picks up whenever the measured impedance is less than or equal to the selected pickup value of impedance. There are several types of distance relays, including impedance, reactance, and mho relays. The mho relay has an inherent directional characteristic; that is, it responds to or “sees” faults in only one direction. On the other hand, the impedance and the reactance relays see faults in all directions. Thus, a directional relay is commonly used together with the impedance relay, and a mho relay is used as a starting unit for the reactance relay. Pilot relaying is a means of communicating information from the end of a protected line to the protective relays at both line terminals. The relays determine whether a fault is internal or external to the protected line. The communication channel, or pilot, is used to transmit this information between line terminals. If the fault is internal to the protected line, all the circuit breakers at the terminals of the line are tripped at high speed. If the fault is external to the protected line, the tripping of the circuit breakers is prevented or blocked. Three types of pilots are commonly used for protective relaying: wire, power line carrier, and microwave pilot. A wire pilot consists of a twisted pair of copper wires of the telephone line type. It may be leased from the telephone company, or it may be owned by the electric utility. The power line carrier is the most commonly used pilot for protective relaying. In this type of pilot, a low-voltage, high-frequency current (30 to 300 kHz) is transmitted along one phase of the high-voltage power line to a receiver at the other end of the protected line. Line traps, located at both line terminals, serve to contain a carrier signal inside the zone of the protected line. The microwave pilot is an ultra-high-frequency radio system operating above 900 MHz. In this pilot, transmitters and receivers operate the same way as in power line carrier pilot; however, line traps are replaced by a line-of-sight antenna.